Domino Island, an unpublished thriller novel by Desmond Bagley will be published by HarperCollins on 16th May 2019. The publishing house released the news on 12th October 2018 at the Frankfurt Book Fair (Frankfurter Buchmesse), during the fair’s 70th anniversary year. Domino Island, which had a working title of ‘Because Salton Died’, together with related correspondence, came to light in 2017 found among the author’s papers held at the Howard Gotlieb Archival Research Center in Boston, USA. The full-length thriller, involving murder and corruption on a Caribbean island before a plot twist leads to an all-action finale, was completed by Bagley and scheduled for publication in the autumn of 1972, but was shelved to avoid a clash with the release of The Mackintosh Man, the Paul Newman movie based on Bagley’s earlier novel The Freedom Trap. The typescript was returned to Bagley and thought lost. It’s fairly well known that Bagley would start a novel and abandon it if he felt that it wasn’t working, and in fact his wife Joan completed the last two books, Night of Error and Juggernaut, after his tragically early death, aged 59. But finding a full-length, fully-formed book more than 40 years later was beyond our wildest expectations. And, my goodness, what a thrill to read an original Bagley, written at the height of his powers when his books commanded millions of sales. Domino Island is a long overdue reminder of just how good and exciting his writing really was. The publication of the book has been negotiated with Moore Stephens, Bagley’s trustees in Guernsey, who, together with David Brawn have been incredibly supportive of aspects relating to The Bagley Legacy project. 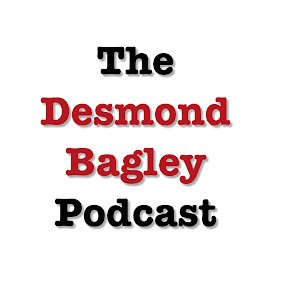 Their continued interest and foresight will help ensure that Desmond Bagley’s novels remain in the public eye and may perhaps even find a new generation of readers. HarperCollins charged author, playwright and Bagley admirer Michael Davies with the task of ‘curating’ the novel prior to its publication. A foreword by Michael Davies is included with the novel as is an afterword, detailing the history of the novel, written by Philip Eastwood. Following the launch at the Frankfurt Book Fair, a holding cover was produced until uncorrected proofs were issued in December 2018. The uncorrected proof dustjacket carried a comment from the award-winning author Mike Ripley who, as an admirer of Bagley’s work, had been provided with a copy of the original typescript. The jacket was designed by commercial book designer and photographer Stephen Mulcahey. Stephen, in addition to designing this cover for HarperCollins, has for many years worked in-house for Pearson, Titan books, Carlton Records, VCI Entertainment, Orion, Penguin Random House, Headline and Transworld and has previously designed covers for the novels of Lee Child, Frederick Forsyth, Andy McNab, Alison James, Lauren North and many others. Stephen’s portfolio of cover art and photography can be viewed on his website. The jacket also displays a portrait of Bagley taken in Strängnäs, Sweden in May 1972 by photographer Bengt-Ove Tideman. The image was taken at the home of Bagley’s close friend Iwan Hedman, aka Iwan Morelius, two months after he submitted his manuscript ‘Because Salton Died’ aka Domino Island to his publishers. There is more information about this publicity photograph and Bagley’s visit to Strängnäs in a previous Bagley Brief feature article, and you can read more about Iwan Morelius on Nigel Alefounder’s site here. Sharp-eyed readers may notice that one of the changes made to the original typescript was the change in the name of Bagley’s protagonist from Robert Armin to Bill Kemp. On 7th February 2019, in a conversation with Michael Davies published on HarperCollins’ Indie Thinking website, Michael talks about his role as ‘curator’ of Domino Island and how he approached finishing a ‘lost’ Desmond Bagley novel. On 24th February 2019, just prior to the printing of general review copies, another review from award-winning author Lee Child was sent to the publishers and a temporary graphic was produced whilst the dustjacket was amended. The amended dustjacket carried Lee Child’s comment on the front page in readiness for the issue of general review copies in March 2019. Bill Kemp, an ex-serviceman working in London as an insurance investigator, is sent to the Caribbean to verify a life insurance claim that will make property magnate David Salton’s young widow a very rich lady. As Kemp begins to discover that Salton’s political ambitions had made him a lot of enemies, and that his friends are reluctant to reveal themselves, local tensions around the forthcoming elections spill over into protest and violence on the streets – and murder. Is this all a deliberate smokescreen for an altogether more ambitious plot? And who is the enemy in their midst? As events begin to spiral out of Kemp’s control, even his army training seems feeble in the face of such a determined foe.